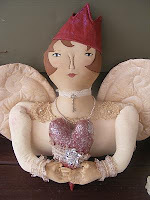 Please check out the new dolly I am offering on www.thehumblearts.com on Feb. 1st. I have wanted to change the name of my business for a long time. I didn't want it to be so drastic that no one would recognize who I was. So I opted to just remove one word "prim" out of Snugglebug Prim Blessins and add one letter "g" to Blessings. Since I have been moving into a slightly different venue of dolls I thought it was the right thing to do. I will probably always keep Snugglebug because I named it after my daughter. Not because that is her name, but because she has always been very a huggy girl and when she will little just loved bugs. So that is the reason I came up with Snugglebug. You will see changes in my company title on my website, Lemon Poppy Seeds, newsletter and Etsy and any other sites that I might be listed on. I appreciate your patience in this new name change for me. Hi everyone. Just wanted to let you know that this blog is under construction and it is a brand new blog. I am hoping to have it up and running in the next few weeks. I have just been accepted at the Humble Arts. I am so honored to be in the presence of such great designers, such as: Soft in the Head, Mustard Seed Originals, Birch Berry Farms and Prim and Proper Folks just to name a few. Wow, what a great cast of designers and artists listed there, so please stop on by February 1st for our new offerings. Thank you Lord for the many blessings and wonderful people you have brought into my life. I am grateful for them all. Thanks for stopping by, you are always welcome here! Have a question or need more information about our products? Please use the form below to send us a message. We will respond usually within 2 business days. I have been a crafter for about 15 years now. It all started after many days and hours of playing Barbie for the millionith (is that a word? LOL!) time with my daughter. I thought to myself, wow, I need to do something that might help my brain return. So off I went to the fabric store and bought a silly bear pattern and fabric. That was the start of Snugglebug Prim Blessins. It wasn't long before I found Country Marketplace (miss you) and ordered lots of patterns. How that helped me learn to create wonderful dolls. I am still thankful for that magazine. 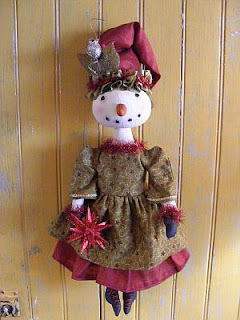 So now I am designing and creating my own line of dollies, Santa's, snowmen, kitty cats and more in the folk art, primitive, vintage and whimsical styles. Hey, thanks for stopping by here at Snugglebug, you are always welcome here! PS. Thanks Lord for the many talents you have given me, without you, none of this would ever be possible.